Last week, I had the honor of speaking at the University of the Pacific’s Center for Business and Policy Research’s 2015 State of the Northern San Joaquin Valley conference. Myself and a group of panelists discussed downtown revitalization in the region, with specific attention given to Downtown Stockton. But the real highlight of the conference was the presentation of the 2015 North San Joaquin Valley Index. Pretty much every economic indicator you’d ever want to find on Stockton and the entire region is available in one handy report put together by the best economists in the area. For a data junkie such as myself, the report is a page-turner. A literal goldmine of information on our community with insight into economic trends, demographics, transportation and much more. But if you’re not like me, and you don’t spend your evenings elbows deep in data analysis, never fear. I’ve taken some time to highlight some of the more interesting findings in the report (interesting to me, at least). Collectively, they show that Stockton is trending in the right direction for the most part, though we lag behind the rest of the state in several respects. You can access the full report here. We’ll start with the most obvious, positive findings of the report. 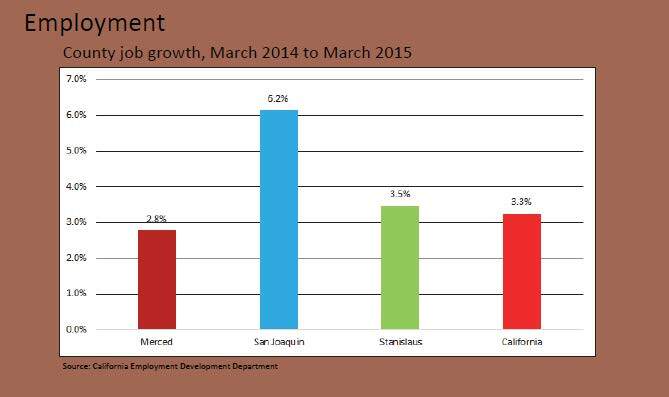 As you can see, San Joaquin County posted an impressive 6.2% growth in jobs from 2014 to 2015, which nearly doubles the state average of 3.3%. Coupled with a steadily declining unemployment rate, it appears that the region’s economy is experiencing a very positive trend, though this is somewhat tempered by the fact that the labor force participation rate remains flat despite an increasing population. To me, this is a very disheartening sign. 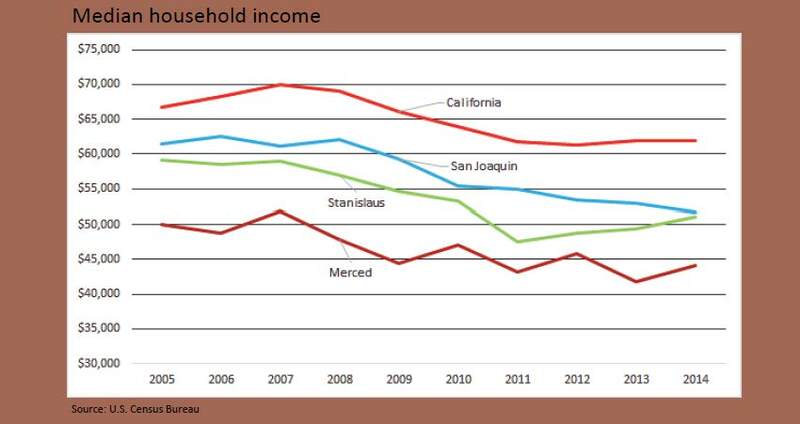 While median incomes have stabilized and even begun to rebound in California as a whole as well as just south in Stanislaus County, median incomes in San Joaquin County are continuing a downward trend. As quoted in the report, “The pattern of declining median income while average, or per capita, income is rising can be a sign of growing inequality.” Moreover, the poverty rate is increasing and wages are flat. Not a good sign in a community that already suffers from severe inequality issues. 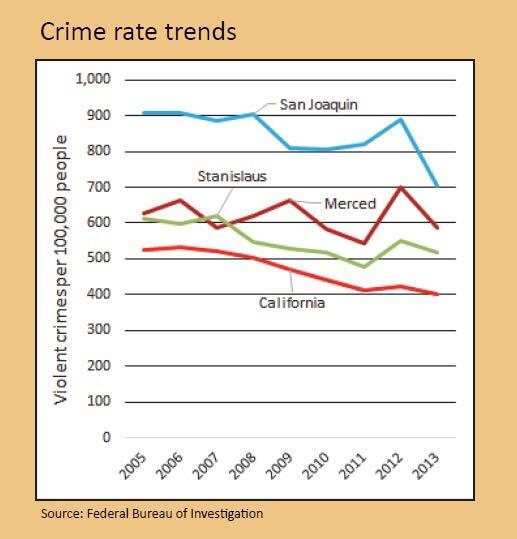 While San Joaquin continues to suffer from a disproportionately higher crime rate, the region’s crime has taken a nose dive, especially since 2012. Of course, if you have been personally effected by violent crime (which I have been recently), then it’s hard to believe that crime is actually going down. But the numbers don’t lie. 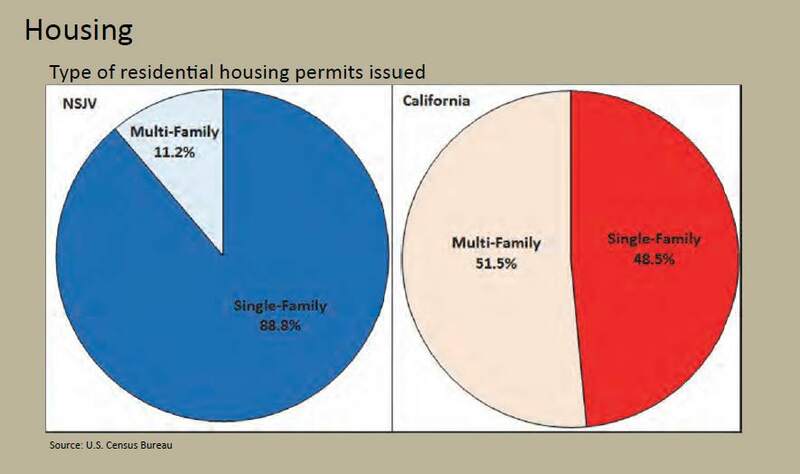 This figure shows the disparity between California and the Central Valley when it comes to housing type. While the rest of the state has been building a diverse housing stock, our region remains obsessed with suburban style growth. Despite median incomes lower than the rest of the state, Central Valley cities continued to pump out way more single-family homes than multifamily units. In a region that lacks vibrancy and suffers from stagnant incomes, a more balanced housing stock is sorely needed to reflect the needs and desires of all Central Valley residents, not just those who are fortunate enough to purchase large single family homes. 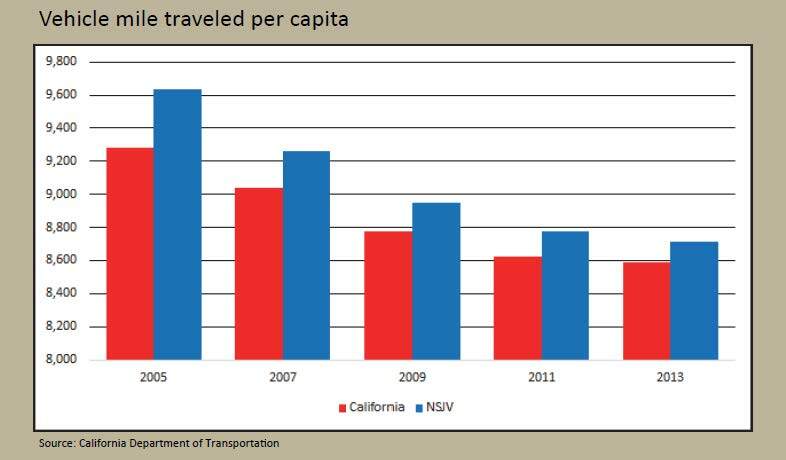 Despite an economic rebound over the last few years, vehicle miles traveled (VMT) continues to decline (though we still drive more than the average Californian). This drop in driving has been accompanied by a rise in commuter and passenger rail in the region. 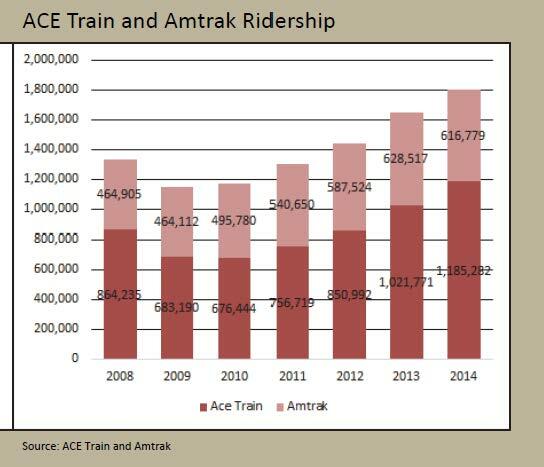 ACE now carries over one million passengers a year, and the Amtrak San Joaquin service is one of the nation’s top five most traveled routes.